Undoubtedly, PCBs are part of the great wonders of the world of electronics, the main allies in technological innovation that users today adore. There are many reasons we can have to use printed circuits, here we can find its main benefits. They provide a basis for the assembly of the components and additionally have a high mechanical robustness. The arrangement of the electronic components on the board is fixed. They allow mass production, making their manufacture cheaper. For larger quantities in production, a lower unit cost can be achieved. The size of the assembled components is small and this influences the decrease in the weight of the electronic device. PCBs eliminate the chances of errors that may arise. The electrical noises are considerably reduced. As long as a set of standards is respected, immunity to electrical noise can be guaranteed within an electronic board. It facilitates the diagnosis and repair of faults present in an electrical equipment. The printed circuits are very compact. The design of very large circuits does not alter the physical dimensions of the boards, thanks to the multilayer technology it is possible to reduce the space considerably. Immunity to movement. All electronic components positioned on a PCB have rigidity since they are welded to a physical surface. In most cases the user does not usually see the electronic boards that are present inside the electronic equipment. A PCB that has not yet been positioned components is called PWB: Printed Wiring Board. 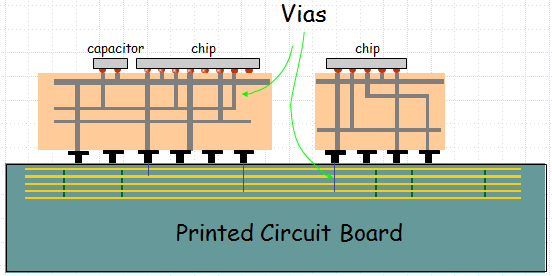 The essential components of a printed circuit board are expressed below. The substrate of the plate is an insulating and rigid material. Normally it is a composite material, formed by fiberglass and epoxy resin, fiber is what gives it hardness and resin is what unites the whole. The thin threads of the surface are part of a copper foil that initially covered the entire plate. In the manufacturing process, this plate was partially removed (by the etching process), so that what remains is a network of connections for the components. These wires are known as the conductor pattern and enable the electrical connection between different components once mounted on the PCB. To fix the components to the plate, their terminals are soldered to the conductor pattern. 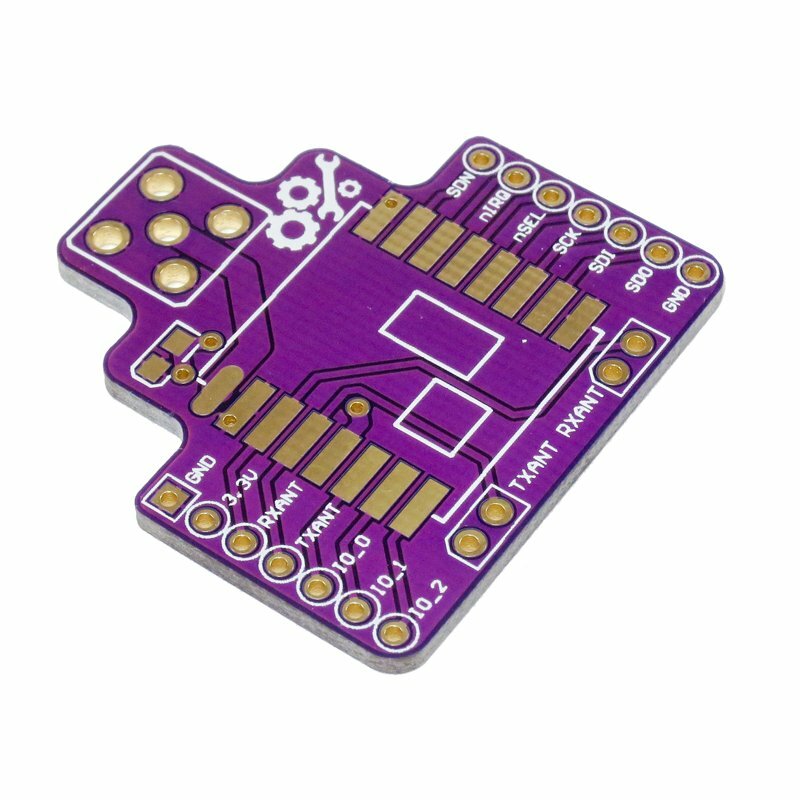 In the most basic PCBs (single-sided boards) the components are located on one side of the board while the driver pattern is on the opposite side. This technique requires holes to allow the terminals of the components to pass through the plate. In this way the pins are soldered on the opposite side to which they are mounted. In this way we can refer in this type of PCB to the face of the components and the welding (component side and solder side). If a component needs to be removable from the PCB after being manufactured it is mounted on a base. The socket is welded on the plate while the component can be put on and removed at any time. What gives the PCB a green or brown color is the solder mask. This mask is an insulating and protective coating that protects the copper (rust) tracks and prevents the solder from sticking out of the connection points for the components. On top of this coating, a legend is printed that consists of text and symbols to label the places for the different components that must be assembled. Fiberglass, and its form used for PCBs: fiberglass cloth, are glass filaments formed by processing molten sand (mainly SiO2). Fiberglass gives the PCB its mechanical strength. Used to form the PCB substrate, mixed with fiberglass, a composite material with good mechanical and electrical properties (both insulators and dielectrics) is achieved. Epoxy resin is a polymer that can be combined with a complementary molecule (the hardener) to form a semi-solid material. The resin is an organic molecule with active points that can be attached to the hardener. If the epoxy resin is a chain, with a point at each end it is called bivalent. The hardener is similar but has the complementary connection points to form the geometry of the rigid material when the two parts are mixed and cured. A very important characteristic of the material of the substrate is its dielectric constant, since it will limit the frequency of operation of the circuit. If the substrate has a lower dielectric constant, the capacitive effect caused by subjecting the material (dielectric) to two different voltages on its faces (since we will have two different conductor patterns on its faces), will be smaller, this will result in faster circuits . Materials based on epoxy resin have a relative dielectric constant (relative to air) of the order of 4.5. You can also look for the opposite effect, try to increase the capacitive effect, in this case for the mass and voltage supply layers, in this way the power supply of the circuit is decoupled. It is created by electrically depositing copper on a spinning titanium drum and continuously separating the resulting sheet from it to be subsequently applied to the PCB substrate. 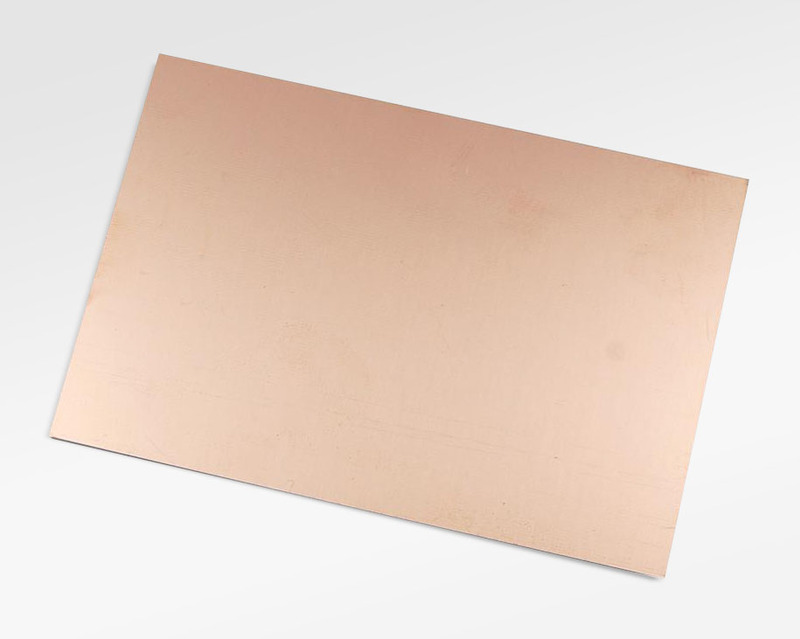 The copper sheets for the signal layers usually have a thickness of 1.4 x 10ˉ³ inches, while those dedicated to ground (GND) or to supply voltage (VCC) will have higher thicknesses. It is the material prior to the substrate, it is a mixture of fiberglass cloth and semi-cured epoxy resin, it is created to then paste the copper sheets and finish with the curing (by applying controlled temperature and pressure). 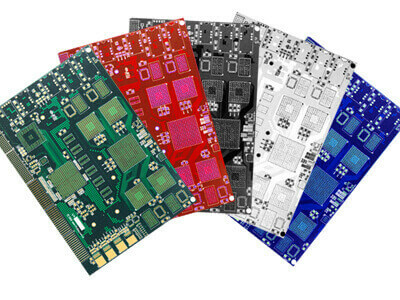 This material is also used in the process of joining different layers in multilayer PCBs. Parts that make up a PCB. Vias: They are vertical connections between layers made by drilling a small hole and filled with conductive material (copper). These exist in the connections of the metal layers, in the silicon chips, inside the encapsulations, and in the printed circuit boards. The viass allow a vertical connection between the layers. In the previous figure we can see it better. Anti pad: An anti-pad is a free space in a copper plane that will allow the drilling of a hole to pass through the plane without making a connection. A good rule of thumb is to have a clearence (space) of 0.25 mm (10 mil) of 0.25 mm annular space, which means that for a 0.5 mm hole you should have a clearence of 1 mm. This may seem a great tolerance, but remember that the inner layers are stretched and shrink and it may happen that some perforation makes contact with the plane and this may cause a short circuit. In the field of PCB manufacturing, the anti-pad is described as: The diameter of the copper-free zone around a metallized hole (PTH) in a feed plane, which electrically isolates the PTH bore from the feed plane. An anti pad is created by placing a disc-shaped object larger than the PTH hole and must be centered in the power plane belonging to the Layout. Since this represents an image in a negative, which means anything transparent black on a photoplot film, in the layout it represents an absence of copper, the object forces a copper keepout in the feeding plane. Practical example of an anti pad. The previous figure shows what was described in the previous paragraph. For the realization of this we must in our layout of the PCB add a layer called Keepout, by doing this we are going to place the anti pad just below the holes. The diameter of the drill should be 0.020 inches (20 mils or 0.5 mm) is an acceptable rule for the pad. Stripline: The Stripline in a PCB is composed of the conductor inserted in a dielectric with GND planes in the Top and Bottom layers. NOTE: An easy way to distinguish Stripline from microstrip, it requires to be able to peel the layers of the card to be able to see the tracks on the stripline. Microstrip: The microstrip in a PCB is composed of the conductor in the upper layer above the dielectric and has a ground plane below. Thermal relief: The pads that remain within a GND plane and are connected to it, can join the plane with three geometric shapes: a cross, a cross or a solid. The first two are used to make a thermal break with the ground plane to facilitate welding. Teardrops: Teardrop shaped object that surrounds the pads, tracks and track angles. The teardrops increase the amount of copper around these objects to minimize possible drilling and metallization errors, since they could cut connections. Test points: It is recommended to put test points in the critical signals. They will be on the “working” face and with a text next to the function, reference, signal, etc. Clearance: Empty space around an object. An object is an area with copper that can be a pad (circular, rectangular, etc.) a track, a ground plane, a geometric figure, etc.